"WE DO NOT INHERIT OUR LAND FROM OUR ANCESTORS, WE BORROW IT FROM OUR CHILDREN"
The Lasting Footprints range is inspired by the need for us to consider the positive impact we could potentially have on various eco-systems in Kenya. The first place we have started with is the Maasai Mara: arguably one of the most significant eco-systems in Africa. The issue of human-wildlife conflict boils down to the simple fact that resource sharing is proving difficult, given that the environment cannot keep up with the current level of grazing. Our solution is to enrich this natural environment, through the Lasting Footprints jewellery range. The range has been entirely inspired and created using the natural phenomena found with the Masai Mara's Olare Motorogi conservancy. Tracking mainly animal footprints with the help of our partners Porini Camps & Air Kenya, we were able to cast moulds of the imprints left on the earth by the wildlife we are seeking to protect. The hyena track we found was one of the first. Check out the full story on our instagram here. Original casts (from left to right) Topi, Impala, Stork, Dik Diks. After locating the tracks of some of the most impactful creatures within the Mara eco-system, we took these casts back to our workshop just outside of Nairobi. Working with highly skilled Kenyan artisans, we began the process of moulding and scaling the original footprints into pendants. These pendants have all been handcrafted by melting down old pipes, broken locks & waste machinery. Each element of the Lasting Footprints range is 100% eco-friendly and employs only recycled materials. Below (right) are some of the original moulds we cast. Through a process of scaling, we were able to capture the exact replica of each animal track into a pendant, each of which is available here. For every piece you buy, we will be planting an indigenous seedling right back into the conservancy in which we found the track in the first place. Join us on our journey to plant the first 100 seedlings this year. 100% recycled: we only use brass that comes from waste. Old machinery, locks & pipes are our main source of material. The hyena track necklace, available here. For wholesale enquiries, please get in touch here. 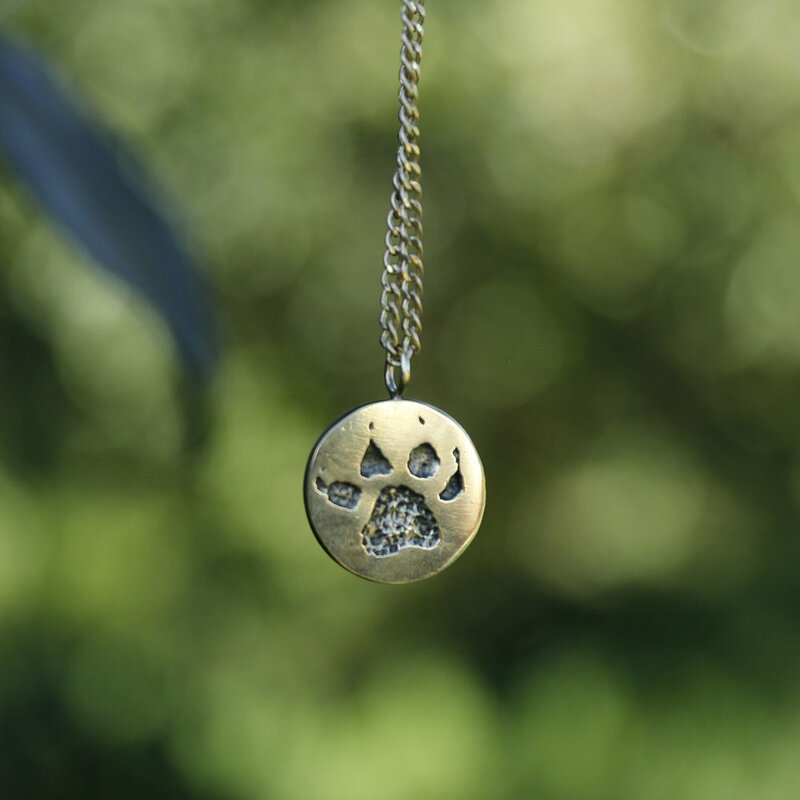 The lioness whose footprint is our lion track pendant, also feature above. "As pioneers of the community conservancy concept we're committed to helping preserve Africa’s unique wildlife, landscapes and local communities. We believe that the best way to do this is through sustainable ecotourism ventures that benefit the local communities and protect the natural habitat for the wildlife, giving our guests a rewarding experience. Our Porini Camps are a sustainable model that practically implements these principles. We developed the conservancy concept over 20 years ago as one of the solutions to stop the increasing losses of wildlife populations in Kenya as a result of the loss of habitat, deforestation, population growth, fencing and overgrazing among other pressures. The conservancies create safe areas of protected habitat for wildlife. We partner with the local Maasai communities leasing large tracts of land in the Amboseli and Mara eco-systerms adjacent to the parks in order to create wildlife conservancies. These are then paid for by using the income from travellers staying at our Porini Camps and they also create livelihoods for the families of the landowners whose plots make up the conservancy. Over 90% of the staff are from the local community which further enriches the guests experience. Guests who stay in the small camps within the conservancies have a very special safari experience as they can see all the wildlife in a pristine wilderness but without masses of other tourists present. We have established a formula of no more than one tent per 700 acres and no more than twelve guest tents per camp in the conservancies which we have been involved in establishing: Selenkay Conservancy in the Amboseli eco-system and Ol Kinyei, Olare Motorogi and Naboisho conservancies in the Mara. This ensures a low-density form of tourism which has less impact on the environment and which provides a more intimate and rewarding experience for our guests. We are delighted to be involved in the “Lasting Footprints” collection and feel privileged for the prints to have been taken from the wildlife in Olare Motorogi Conservancy and from this for the opportunity of trees to be planted". We would like to extend our gratitude to Porini & Air Kenya for their support of this project.